Just three days prior to the hard fork, Bitcoin Cash currently has the highest flash return rate out of all supported currencies. Currently, Bitcoin Cash's flash return rate hovers around 0.54% while the maximum rate on Bitfinex of 0.75% has already been reached a few times over the weekend. The flash return rate is the average of all fixed-rate positions, of all terms, weighted by their amount. It is basically the average daily rate on funding that allows traders to adjust the rates automatically. Bitfinex announced on Sunday that it will fully support the upcoming Bitcoin Cash hard fork and said that "at the time of writing, we do not believe that there is sufficient consensus to identify a clear winner in the Bitcoin Cash hard fork". 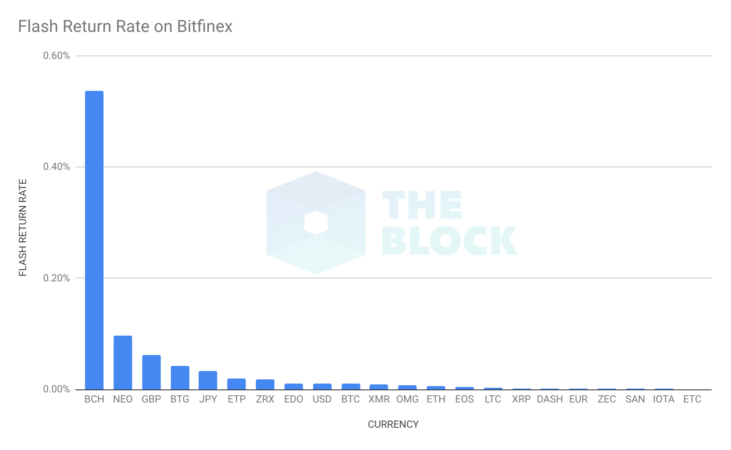 During the Bitcoin fork on August 1, 2017, Bitfinex fully supported and credited all Bitcoin holders with the corresponding balances of Bitcoin Cash. Following the fork in 2017, all the borrowers had to repay Bitcoin Cash to pre-fork Bitcoin lenders. The Block has reached out to Bitfinex to clarify how it will handle the situation this year as it remains unclear.